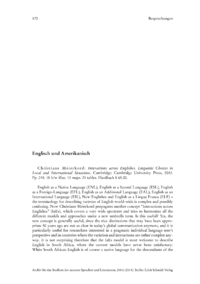 English as a Native Language (ENL), English as a Second Language (ESL), English as a Foreign-Language (EFL), English as an Additional Language (EAL), English as an International Language (EIL), New Englishes and English as a Lingua Franca (ELF)  the terminology for describing varieties of English world-wide is complex and possibly confusing. Now Christiane Meierkord propagates another concept Interactions across Englishes (IaEs), which covers a very wide spectrum and tries to harmonize all the dif ferent models and approaches under a new umbrella term. Is this useful? Yes, the new con cept is generally useful, since the nice distinctions that may have been appropriate 50 years ago are not so clear in todays global communication anymore, and it is particularly useful for researchers interested in a pragmatic individual language users perspective and in countries where the variation and interactions are rather complex anyway.